It’s not a lie; it’s actually rather delicious and absurdly rich. The cake from the video game Portal is not exactly an easy feat in the kitchen… but it’s worth it. 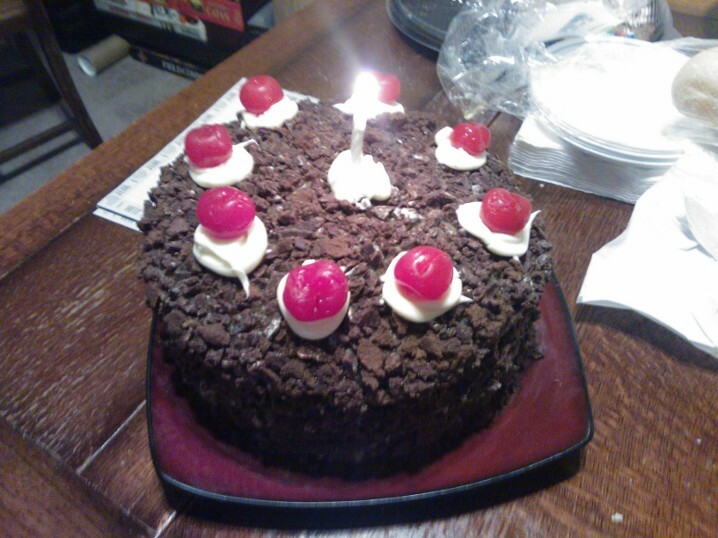 Following the recipe provided by Valve, this delectable entity calls for three layers of chocolate cake… two of which are boxed cake and one of which is homemade (don’t question the methods of Glados, children). To make this at home you’ll need two rounded cake pans (any size) and a double boiler. If you do not have a double boiler lying around, you can take two pots (one large and one small enough to fit inside the other). Fill the larger pot with water. Boil the water in the large pot and then submerge the small pot in it (see Figure 1); this will prevent the chocolate from sticking to the pot. Combine boxed cake mix with vegetable oil, eggs, water, and pudding mix. Add a couple splashes of milk to keep the cake moist. Flour or grease TWO round cake pans and fill both with the batter, following baking instructions on the box for the baking time of the cakes. Now it’s time to make the middle layer of cake from scratch (oh, Portal…). Combine butter and sugar and cream together until well-mixed. Add eggs and vanilla extract. In a separate bowl, add all dry ingredients: flour, cocoa, baking powder, baking soda, and salt. Then slowly add the dry mixture to the rest of the mix. Add 1/3 cup milk or water to the mix, stirring until well blended. Pour the batter into a SINGLE cake pan and bake at 350 degrees F for 30-35 minutes. 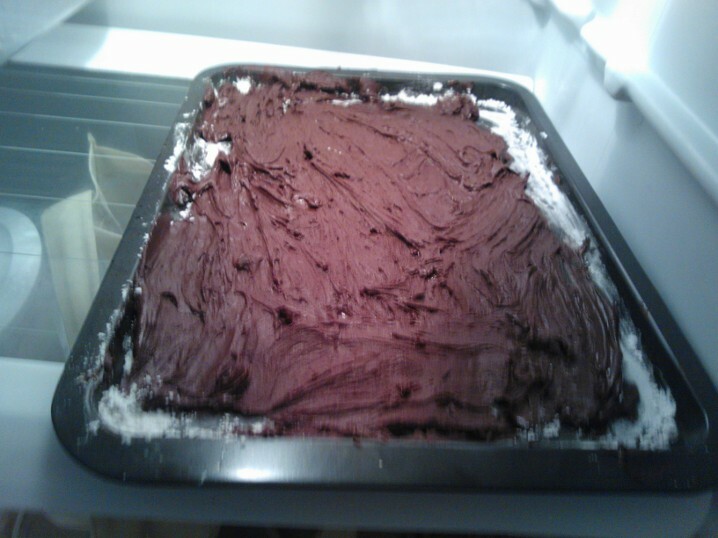 While the cake is in the oven, began to melt your chocolate chips. To do this use a double boiler, which prevents the chips from sticking to the pot (see above if you don’t have a double boiler). Keep stirring until the chips are melted. Spread the melted chocolate over wax paper on a cookie sheet. If you don’t have wax paper, flour works as well. Store sheet in fridge until the chips solidify again. Once the chips solidify, chop them up into chocolate flakes. Store back in the fridge to keep the flakes firm. 8. 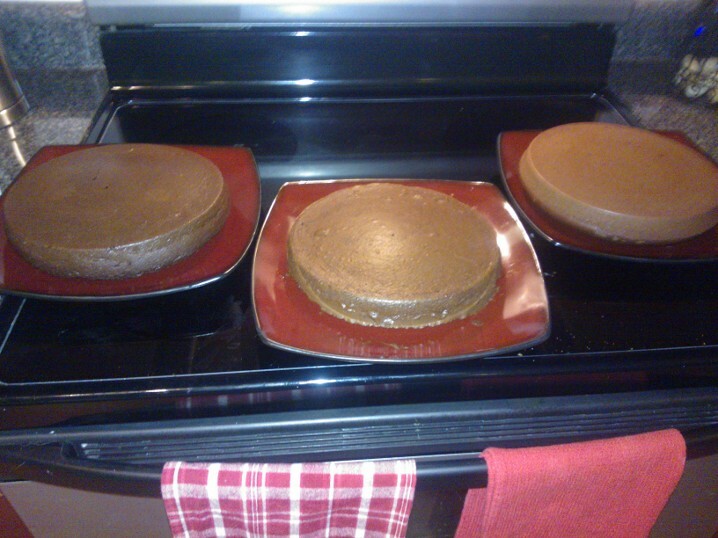 Once all three cakes are baked, lay them out and level them flat with a cake knife (see figure 3). 9. Stack the cakes, using the vanilla frosting to evenly layer between each cake, spread the frosting on every layer but the top cake. 10. 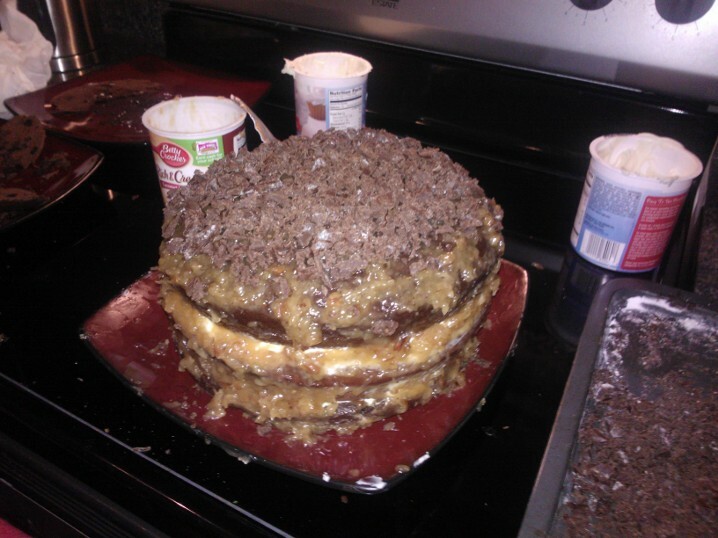 Once the cakes are stacked, cover the entire outside of the cake with the coconut pecan icing. 11. Coat the cake in the chocolate flakes. If you run out of flakes, simply use crumbles of the chocolate cake that was layered off. 12. Put some vanilla frosting in a ziploc bag, cut off a corner, and create eight small circles around the cake and one small circle in the middle. Remove the stem from cherries and place them on top. 13. Eat it without getting killed and enjoy the fact that you created something that should only exist in a divine-chocolaty heaven. Too bad my baking skills are limited to sponge cakes, anything that’s more advanced usually turns out not too great. Sponge cakes can be pretty complicated though! Your comment gives me hope. Maybe I will be able to bake a Portal cake after all!